Following the Great Exhibition of 1851, Prince Albert proposed a permanent series of facilities for the enlightenment of the public. Gore house, and its land, was purchased ready for construction of the buildings. However, work was slow and, in 1861, Prince Albert died, and work ground to a halt. 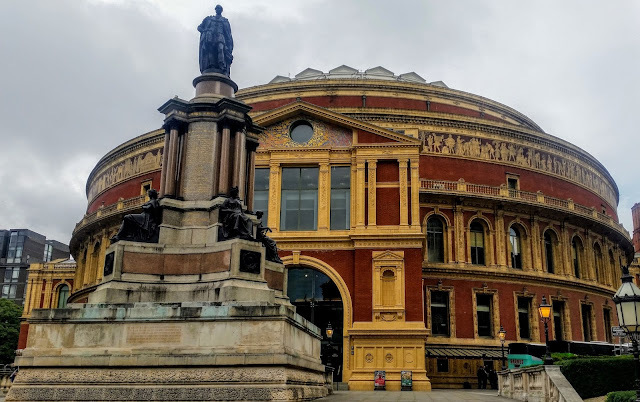 It was decided that a memorial and great hall should be built, in his honour, and in 1867, Queen Victoria laid the foundation stone, for what would become the Royal Albert Hall. The hall was officially opened on March 29, 1871, where a speech was given by Edward, Prince of Wales, who spoke in place of Queen Victoria, who was too overcome to speak. It became apparent immediately the concert started that there was a problem with the acoustics, as an echo could clearly be heard. As a way to dampen this effect, an awning of canvas was suspended below the dome whicj, although not perfect, helped. Throughout the 1870s many famous composers performed in the hall. These included, Camille Saint-Saens and Richard Wagner. In 1888 the hall had its thousands of gas lets, which, using a unique system, only took ten seconds to light, replaced with electric lighting. In 1949 the awning was removed and replaced with aluminium panels that worked better than the canvas, but still left a faint echo. It wasn't until 1969 that fibreglass acoustic diffusing discs were installed, finally solving the acoustic issues of the dome. The hall went under a £20 million renovation and development project, between 1996 and 2004, which saw improved ventilation, increased seating with more legroom. better backstage areas, enhanced technical facilities and more bars and restaurants were added. The largest development was the construction of an underground loading bay and the complete rebuilding of the south steps, which now lead to a new foyer and box office. The memorial, at the top of the south steps, is entitled Memorial to the Great Exhibition of 1851, and has a statue of Prince Albert standing above four women, who represent Europe, Africa, America and Asia.